Here at Brakes Plus, we want to make sure that every vehicle that comes through our doors gets the same high-quality, professional service and attention to detail that it deserves. How is your car running? Your truck? Your 4×4? If you said anything but “Perfectly”, you should come see us. 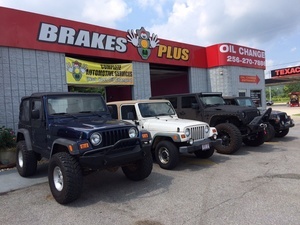 Brakes Plus is a local, independently owned and operated vehicle repair shop. We offer a wide range of automotive services and strive for outstanding customer service. Our local shop treats you like one of our own. 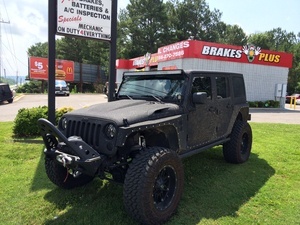 The Brakes Plus team takes the time to check your engine, transmission, differentials, brake pads, rotors, struts and much more, to find a fix for most issues your vehicle may have. We offer FREE brake, battery, and A/C inspections. It’s all part of our effort to be your first choice in automotive repair and keep you- our valued customer- coming back to Brakes Plus for your vehicles’ maintenance and repairs. Now, you have heard the old saying about mechanics being less than honest. But for Brakes Plus, that just does NOT fly. We will not do anything to your vehicle without your say so. At Brakes Plus, we will treat your vehicle like it is our own mother’s car. That’s a fact! You will get incredible service with lifetime warranties on brake pads and limited warranties on most other repairs. 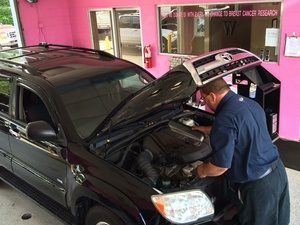 We make a donation from each oil change to breast cancer research and have contributed to several local athletic programs. Call us today at 256-270-7886 to schedule an appointment or come by and talk to one of our knowledgeable technicians. We offer local pick up or delivery of vehicles or you if needed.